Oconee county is facing major decisions on wastewater treatment that will have significant impact on future residential, commercial and industrial growth in the county, a public presentation and discussion last (Tuesday) night at the Civic Center indicated. The gathering, labeled an Open House On the Water and Wastewater Master Plan Update, was attended by 40 citizens and was hosted by Wayne Haynie, director of the Oconee County Water Resources Department, formerly called the Utility Department. Haynie began the session with a 30-minute overview of the three questions he wanted citizens to address dealing with the extension of gravity fed sewer lines, reusing wastewater as a drought management strategy, and the proper allocation of wastewater treatment among the different types of users. Haynie said he wanted the citizens present to go to three tables set up around the room and give feedback on the three questions, but he asked for questions about his presentation first. That invitation unleashed a long list of concerns centering on use of gravity fed sewer lines down Calls Creek and Barber Creek in particular and more general concerns about development in the county. Haynie brought with him to the meeting Paula Feldman, an engineer with Engineered Horizons of Duluth, and Jimmy Parker, and engineer with Precision Planning Inc. of Monroe. Feldman and Parker are assisting Haynie and the county in its update of its water and wastewater master plans, and they joined Haynie at the front of the room. The public meeting last night is part of that update process for the master plan. Oconee County Board of Commissioners Chairman John Daniell also came to the front of the room to field questions before the group finally split at the end of the first hour to visit the three tables, where Feldman, Haynie and Parker moved to answered questions. Discussion at the three tables was limited, and the gathering broke up before the scheduled 8 p.m. closing of the session. Haynie said the first question he wanted those present to address was whether the county should expand its sewer service by extending lines down its creeks so sewage can flow to treatment plants via gravity, reducing the number of pump stations from its current level of 35. Given that development is in the northern parts of the county at present, that would mean running gravity lines down Barber Creek and McNutt Creek, which parallel each other and traverse the northern part of the county. The county already has built gravity lines along parts of McNutt Creek. Gravity lines would encourage residential development to occur along those gravity fed lines, resulting in higher density development, Haynie said. The second question Haynie wanted the citizens to address, once they moved to the three tables, was whether to include the use of treated wastewater as a tool of drought management. The proposal is to reuse water from the Calls Creek plant for irrigation at the Herman C. Michael Park and Oconee Veterans Park on Hog Mountain Road to help maintain the fields in the parks. This would require the county to build storage facilities at Calls Creek plant and then transmission lines to the parks. The treated water also could be used in agriculture, Haynie said. At present, the county allocates 50 percent of its wastewater treatment capacity to commercial and institutional uses, such as restaurants, retail shops, businesses, schools, hospitals and governmental offices. Another 30 percent is allocated for residential use. The final 20 percent is allocated for industrial and manufacturing use, including warehousing. Haynie said he wanted citizen input on whether that allocation should be changed. Most residential development in the county relies on septic, and the allocation is particularly important as the upgrade to the Calls Creek plant now underway expands the capacity of that plant from .667 million gallons per day to 1.5 million gallons per day. Haynie said the county should consider forcing residential developers to include sewer infrastructure in future developments rather than continue to rely on septic systems. Haynie made it clear that he wants to expand the gravity fed system. He said it is his goal to eliminate pump stations, in part as a means of decreasing operational costs. He also made a strong case for the reuse of water from the Calls Creek plant and included in his presentation a video showing how Google reuses water to cool its data center in Douglas County, west of Atlanta. Haynie was less clear on what he wanted citizens to say about the allocation of wastewater treatment capacity. He did note that the county was paying its economic development staff to go out and sell the water and sewer resources of the county, making some protection of that allocation important. Haynie didn’t say this explicitly, but his presentation indicated that any decisions the county makes about wastewater treatment and about water use today are shaped by decisions made by the county in the past. The county inherited the Calls Creek wastewater facility, built on a hill above Calls Creek on the edge of Watkinsville, from the city, and has to pump sewage to the plant and discharge from it into a relatively small stream with limited capacity for accepting sewage page effluent. The county built its Land Application Site, its only other treatment facility, at a high point in the county on the ridge between the Appalachee River drainage system and Oconee River draining system. That location means that the county must rely on pumps to get untreated sewage to the site. Over the years, the Board of Commissioners has approved subdivisions all along its creeks, including along McNutt Creek, Barber Creek and Calls Creek. Those subdivisions are served by septic systems, and land was not set aside in the zoning or platting process for gravity-fed sewer lines inside the subdivisions or for lines along the creeks themselves. One example is the subdivision in which I live, Welbrook Farms off Daniells Bridge Road, which has many houses very close to Barber Creek. The house my wife and I own is one of those along the creek, and we bought it because of the proximity to and view of the creek. Almost all of Haynie’s presentation, and most of the questions asked, dealt with wastewater. An exception was a question from Charles Baugh, who lives in the south of the county, about Hard Labor Creek Regional Reservoir. Haynie said the county would not need water from the Hard Labor Creek Regional Reservoir, now nearly filled in southeastern Walton County, until 2045 to 2050. The project is a joint one between Oconee County and Walton County and was built based on projections both counties were in desperate need of water from the reservoir. Parker said that Walton County’s needs are more immediate than are those of Oconee County. He projected it would be only five to seven years before Walton County would require water from the reservoir. Oconee County is obligated to pay 28.8 percent of the costs of the project, with Walton County picking up the remaining 71.2 percent. The next step would be construction of a water treatment plant and distribution system for the treated water. Oconee County has three members on the Management Board, and Walton County has four. 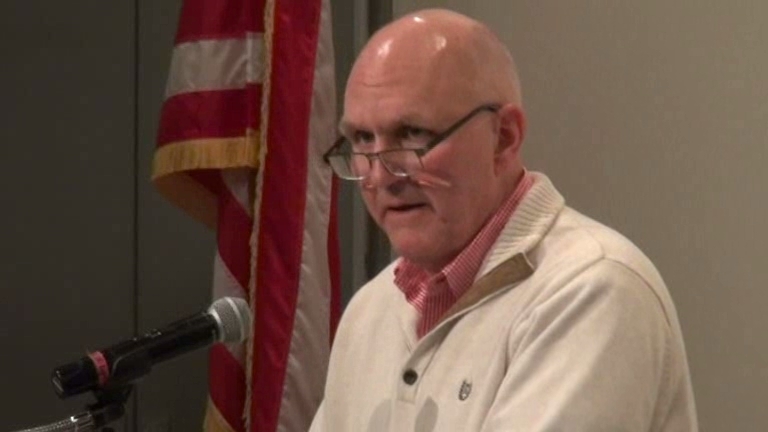 The first persons to try to ask a question once Haynie closed his comments was Jim McGarvey, president of Friends of Calls Creek, which has been fighting a plan by the county to put a gravity fed line down that creek. Haynie cut McGarvey off and was assisted by Commission Chair Daniell, who said the goal of the meeting was to get responses to the three questions posed by Haynie. The effort had little effect, however, as many of the 20 plus questions that followed were on Calls Creek. Others came from those opposing the proposed gravity lines down Barber Creek. A number of speakers called for reliance both on pump stations and gravity fed sewer lines. 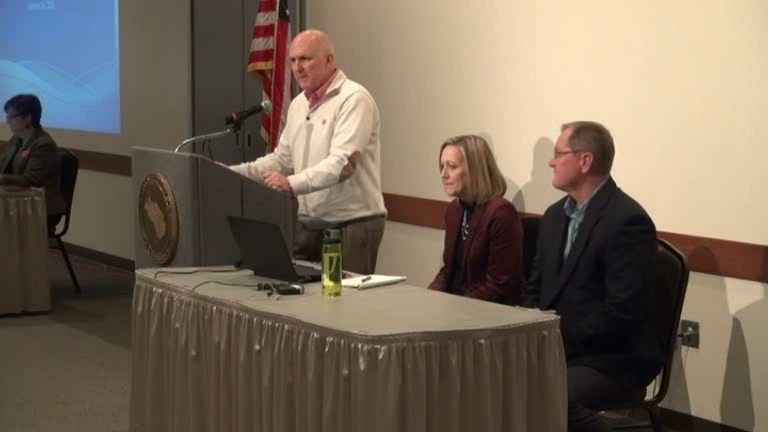 And at least two speakers said they didn’t want to be constrained by the three questions posed by Haynie and desire a more open discussion of sewer issues in the county. Chair Daniell said that opportunity would come at the next Town Hall meeting, scheduled for 6 to 8 p.m. on Jan. 23 at Oconee Veterans Park. The video below is of the entire meeting on the Open House On the Water and Wastewater Master Plan Update. Haynie’s opening comments run to 31:50. Citizen comments begin at 31:51. The formal session ends at 58:35. I have included three brief clips at the end of the video of discussion at each of the tables. Parker was at Table 1, Haynie at Table 2, and Feldman at Table 3. 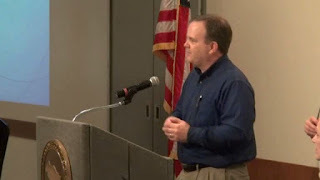 OCO: Water Resources Meeting 1 16 18 from Lee Becker on Vimeo. Clean creeks and rivers should be the priority in any plan. If it means starting over correcting past plans do it. Clean water is important to all people in Oconee and needs to be the number 1 issue for commissioners. Agree with you Vickie, except I do not agree with cutting a path wider than a three traffic lanes through established backyards along our creeks! The engineering can be accomplished with a combination of pump stations and gravity flow down existing easements. Good to see Daniell reach to the FOCC. The issue with Haynie is he's so darn condescending and arrogant, never ever admits a mistake by himself and his department. Bro, you're not always the smartest person in the room. Oconee is full of highly intelligent professionals and retirees. And learn how to "Own It" instead of passing the buck. Buddy, there is only one right answer: "We apologize for this spill. It's unacceptable and we take full responsibility for it. We will work our hardest for the citizens of Oconee to prevent it from happening again". If Haynie keeps ups his nonsense and questionable performance, the Board of Commissioners are solely responsible for his continued employment. Oconee County Board of Commission Chairman, John Daniell, reached out to the Friends of Calls Creek, Barber Creek and other interested parties to hold an open discussion of sewer lines down our Oconee County creek corridors. In recent discussions, Chairman Daniell has expressed he is open to finding alternatives to pipes going down our beautiful creek corridors. This is an excellent opportunity to learn, discuss and possibly impact county decision making. Let's all try to attend this meeting. Where's the money for modern sewerage and treatment? Why, there it is in the recently "Found Money" left over from SPLOST 2004, 2009, and 2013. Wonder where it's been?